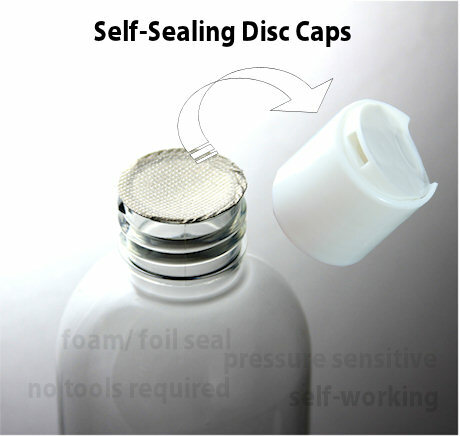 Caps with pre-inserted self-sealing discs. Simply screw on the caps! No special tools required. These caps are a great way to seal bottles filled with product. They seal keeps the product fresh, provides extra spill protection, and lets a customer know they are the first to touch the product. You May also purchase these as an option on the drop down cap selection boxes when you order your bottles. The self working mechanism is already inserted into the caps. Simply screw on the caps to a filled bottle. Once the cap is unscrewed, the foil-lined foam liner will adhere to the bottle. Please Note:May not be compatible with all products. Always make sure the rim of the filled bottles is clean and free of any oils, it is always best to wipe bottle openings with alcohol. Please test this and all closures on your particular product for compatibility and performance prior to committing to large quantities and/or production time frames.